Hip arthroscopy has been practiced for more than 25 years, but it has only been in the last decade we have seen the importance of this surgery in the treatment of patients suffering hip disease or injury. While today it is the fastest growing area of Orthopaedic Surgery, there are few true experts of Hip Arthroscopy in Connecticut. The use of hip arthroscopic surgery is now the corner stone of hip joint preservation. Dr. Joyce began doing hip arthroscopy in 1995 and is one of the few experts in this field. As the practice of hip arthroscopy expanded, so did his involvement in this growing field. He has been a member of the prestigious International Society for Hip Arthroscopy (ISHA) since it was formed in 2008. Today there are just over 300 international surgeons in the society. In addition, Dr. Joyce has been an associate master instructor for hip arthroscopy for the AAOS/AANA since 2011 where he teaches advanced hip arthroscopy techniques to orthopaedic surgeons from around the world. If you are like most patients, you know that your hip hurts – but it’s hard to describe the problem. Surprisingly it can be quite difficult for many patients to explain to their doctor how they experience hip pain. You may not always have pain in the hip joint. It is common for the pain to be felt in the groin, the top of your thigh, the outside of the hip, behind the hip or in the lower back. Your hip may have pain with exercise, or only have pain after exercise. It could hurt with running or only while sitting. Sometimes there are noticeable mechanical symptoms such as snapping or catching – even hip locking. It is not unusual for pain to be referred to the lower abdomen. This wide variety of symptoms is why getting an accurate diagnosis is difficult. An expert examination is critical. Also properly performed x-rays, MRI or CT scan may be needed. Occasionally an injection of Novocain into the hip joint will finally confirm the diagnosis. ​Evaluation is necessary when symptoms have persisted for more than a few weeks in spite of rest. Also, when an injury to you hip doesn’t get better – it is time to get it checked out. An evaluation by your primary care physician is a good place to start. The doctor may prescribe physical therapy or non-steroidal medications like ibuprofen. The next step would be a referral to Dr. Joyce so that I can examine your hip. If necessary we will order your MRI in order to make sure the study is done as well as is possible. There are many different etiologies of femoroacetabular impingement. It is most clearly attributed to developmental abnormalities of the hip that occur during the childhood or adolescence. Perhaps more commonly, it is associated with osteophytes (bone spurs) that form during adulthood or from sports participation. Diagnosis of this condition can be made with xrays and is sometimes aided by MRI or CT scan. Patients at risk are generally athletes or very active individuals. Symptoms can begin in your early 20s or 30s. While FAI can occur later in life, it becomes less treatable after age 50. This is because older patients with FAI likely have associated hip arthritis and are beyond a point in which FAI surgery is beneficial. The most easily diagnosed type of FAI is an abnormal shape of the femoral head and neck. This is called a Cam lesion. There is a prominence of the bone on the front of the femoral head so that when the hip is flexed upward the bony prominence engages with the front of the acetabulum, resulting in breakdown of both the labrum and articular cartilage. The less distinct type is a lip of bone overhanging the front of the acetabulum that pinches the labrum and causes it to tear. This is called a Pincer lesion. Because of its location, it is harder to see on regular x-rays. Many individuals may have this abnormally shaped bone without symptoms and do not require specific treatment. When symptoms do occur, it is usually as a consequence of cartilage breakdown. If hip arthroscopy is needed to address cartilage damage and labral tears, it is also important to evaluate and address FAI that may be the root cause of the problem. Pain can be constant, but is more likely to be intermittent with intervals of time that are pain free. Pain (or deep aching) is usually in the inner thigh or groin and will arise after walking, running, or prolonged sitting. You may notice a locking or clicking sensation within the joint. Commonly patients will describe pain or stiffness after driving or sitting for prolonged periods of time. Also, difficulties with putting on socks or walking up hill are reported. There may be referred pain to the low back, buttock, or SI joint. Finally it is common for the pain to be confused with other sources of pain. Non-operative treatment is where we start, although success is often limited. Most insurance companies will require a minimum of 6 months of activity modifications or rest before approving surgical treatment. Not bad advice. Physical therapy is often prescribed and should focus on strengthening the hip, but you should avoid excessive stretching which can make symptoms worse. Avoid the activity that causes the pain. Anti-inflammatory medications, such as ibuprofen, can be used for a short duration. Management of impingement has traditionally been described with open surgical techniques. The transition to arthroscopic surgical treatment carries the advantage of a less invasive procedure. This advantage is especially evident in more advanced cases. Once the articular cartilage loss has become severe, correcting the impingement becomes less critical since the irreversible damage has already been done. Sometimes it is simply hard to tell the severity of the articular loss prior to surgery. Arthroscopy has the advantage of being able to assess the severity in addition to addressing the impingement. If the joint is beyond help, at least the surgery has not been too extreme. The arthroscopic surgery is done as an outpatient and you will be able to put full weight on your hip – but must use crutches for up to 4 weeks. Physical therapy begins within 2-3 days of surgery. Most patients need 3-6 months for a full recovery and the return to unrestricted activity. 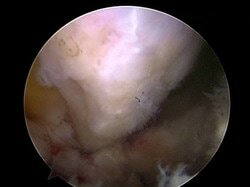 Labral tears are the most common problem treated with arthroscopic hip surgery. The hip labrum is similar to the meniscus in the knee (commonly referred to as a torn cartilage). This cartilage runs on the edge of the bony rim of the acetabulum (the hip socket. The labrum deepens the socket and increases hip stability. Hip labrum tears are the result of either trauma or degeneration (from repetitive bony pinching within the hip socket). Sport injury is especially common in younger athletes participating in soccer, ice hockey, football, marshal arts, baseball, softball and crew. It is also common in dance, cheerleading and gymnastics. Other sports are less common. Common symptoms include minimal to severe hip pain, locking, catching or stiffness. Sporadic symptoms are common. Labral tears may occur from an acute injury such as twisting, but often occur as a consequence of repetitive activities and can happen simply as a result of degeneration or deterioration of the cartilage. In general, a healthy labrum is pretty resilient to injury. Only a few specific causes have been identified. Sometimes the way the hip joint is shaped may make this cartilage easier to tear. Among competitive athletes, it can occur as a consequence of breakdown as the body is pushed beyond its physiologic limits. Degeneration of the labrum is also recognized as an inevitable consequence of the aging process. X-rays are usually normal, since they only show the bone and not the cartilage or other soft tissue structures around the hip. MRI (magnetic resonance imaging) is a more sophisticated non-radiation imaging technique for showing the various soft tissues. This must include a technique where dye is injected inside the joint to enhance the images (an arthrogram). Even these sophisticated studies will miss problems in the joint about one third of the time. In general, they are best at showing injury to the labrum, but still poor at showing other problems, especially damage to the articular cartilage. 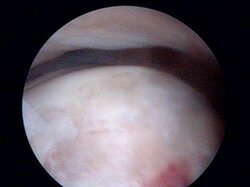 Arthroscopic treatment of a simple labral tear can be very successful. However, labral tears are often not so simple. 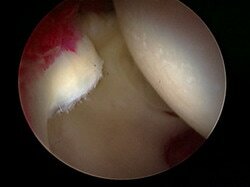 Studies have shown that the majority of labral tears will have some associated damage to the articular cartilage. While MRIs are better at showing labral tearing, they usually will not show the associated injury to the articular cartilage. This is best defined and addressed during arthroscopy. 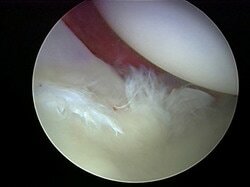 However, the arthroscopic treatment of articular damage is generally less successful. Thus, when treating labral tears, it is often the uncertain, but expected, extent of associated articular damage that may be the limiting factor on the success of the procedure. Neglecting a labral tear with worsening symptoms can result in more secondary hip structural damage. A labral tear is not an emergency but, in general, it is preferable to recommend arthroscopic treatment of these injuries rather than letting them go indefinitely as the symptoms are getting worse. Degenerative labral tears in older patients are a bit different than those seen in our younger athletes. The passage of time with wear and tear can lead to a degenerative tear. There have been reports where MRIs have shown evidence of injury to the labrum among asymptomatic volunteers and some patients with injury have come to be pain free over time. Thus, a trial of conservative management may be appropriate as long as the symptoms are not worsening and the joint is given a chance to rest. Non-surgical treatment is also recommended for patients who have a labral tear associated with hip arthritis. Arthroscopic finding of a labral tear and damage to the hip socket from 2 years of untreated FAI. The MRI in this patient was read as normal. Most things that pop and snap around the hip do not originate from the joint itself. Hip joint problems may cause sharp stabbing pain, catching, or a sense of locking, but the two most common things that snap or pop are the iliopsoas tendon and the iliotibial band. These are structures that reside outside of the actual hip joint. The iliopsoas tendon comes from the pelvis as it crosses the front of the hip and then inserts below it on the lesser trochanter of the femur. The tendon flipping back and forth across the front of the hip can often produce an audible “clunk” that can be heard from across the room. Typically, the clunking sensation occurs as the hip goes from a flexed to extended position. This is present normally in 5 to 10% of the population, and is not an indication of progressive damage or future problems. Occasionally, from injury or overuse activities the clunk can occur and start to be painful. This can usually be managed with conservative treatment. The most important first step is to identify factors such as activities that tend to worsen the symptoms and modify these for a temporary period of time until the discomfort resolves. Physical therapy and oral anti-inflammatory medications can often be beneficial. In the past, when surgery was indicated, it had traditionally been managed with an open operation. Now it can be addressed with arthroscopic techniques. This has eliminated many of the complications associated with the open procedure. It is much less invasive and allows for an easier recovery. Another important finding is that many patients with a snapping iliopsoas tendon also have damage inside the joint. With the arthroscopic method, this joint damage can be addressed simultaneously to releasing the snapping tendon. The technique consists of releasing the tendinous portion of the iliopsoas, preserving its muscular fibers at its attachment site to bone. This results in relaxation of the iliopsoas and eliminates its snapping. The iliopsoas is a powerful hip flexor. Lengthening this can result in a period of hip flexor weakness. Our experience has been that the strength recovers and the snapping is eliminated. The iliotibial band is a broad tendon that goes down the outside of the hip from the pelvis to the thigh. The tendon normally glides back and forth over the prominence of the greater trochanter, which can be felt along the outside edge of the hip. A condition can develop where the tendon snaps back and forth across this bony prominence. This can occur from trauma, but some people can demonstrate the anomaly even in absence of injury and it is not an indication of future problems. The snapping is visually quite evident. While snapping of the iliopsoas tendon can sometimes be heard, mostly snapping of the iliotibial band can be seen from across the room. It may even give the appearance that somehow the hip is popping out of the joint, but this is not the case. The visual effect is simply created by the bulk of the muscle and tendon as it flips across the greater trochanter. If the condition becomes painful, most will respond to conservative treatment. Once again this starts with trying to modify activities that may seem to provoke the symptoms. Supervised physical therapy and oral non-steroidal anti-inflammatory medications can also be helpful. Stubborn cases may even benefit from judicious use of a cortisone injection into the bursa underneath the iliotibial band. The injection alone does not cure the snapping, but reduces the associated discomfort and gives therapy a better chance to work. Surgery is rarely necessary for this condition and should be considered only as a last resort. Under favorable circumstances, the surgery can be helpful. 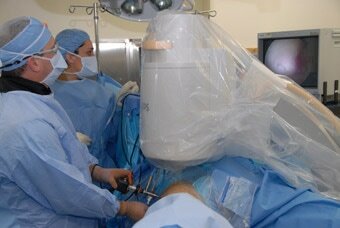 Hip arthroscopy consists of selective incisions that relax the tendon while preserving its structural integrity. This corrects the snapping while allowing a fairly liberal recuperation. Physical therapy and structured post-operative precautions are still important. Sciatica is characterized by radiating nerve pain extending from the back of the hip down the leg towards the outer side of the ankle. Approximately 95% of sciatica is due to nerve root irritation in the lumbar spine (your back). This can occur in people without accompanying back pain. Less frequently, sciatica can originate outside of the lumbar spine. For these cases, the piriformis muscle may be the culprit. The piriformis is a small muscle that exits through a notch in the back of the pelvis along with the sciatic nerve. The sciatic nerve passes underneath the muscle and courses down the back of the leg while the piriformis crosses over to attach on the back of the hip. Either from trauma or overuse problems, the muscle can compress the sciatic nerve and characteristically cause pain in the back of the hip as well as radiating sciatica symptoms. Regardless of whether sciatica is coming from the back or the less common piriformis, patients will respond to a generalized conservative program. This includes trying to identify and modify any offending activities as well as supervised physical therapy and non-steroidal anti-inflammatory medications. Treatment by a knowledgeable physical therapist often can help alleviate the symptoms and may also help to clarify the diagnosis. Recalcitrant sciatica usually obligates a more extensive investigation of the lumbar spine, sometimes including an MRI. If piriformis syndrome is suspected this can be substantiated by palpation of the piriformis over the sciatic nerve as it exits from inside the pelvis and can often respond to an injection within the piriformis muscle. The injection may be therapeutic as well as diagnostic, localizing the piriformis as the source of symptoms. It is rare, but in some cases, surgical release of the piriformis and decompression of the sciatic nerve can be successful. This is performed as an open procedure. There are numerous anomalies where the nerve may pass through or around portions of the piriformis muscle, thus this entire area must be carefully explored assuring adequate decompression of the nerve as the piriformis muscle is released. While the results are often remarkable in regards to pain relief and patient satisfaction, it is not always the case. This short coming reflects some of the difficulties with this diagnosis even with the most thorough clinical evaluation. We have experienced no complications with this procedure, but there are always potential risks associated with open surgery in this area. As we age things wear out. This is also true of the hip joint. The two most common structures to wear out too early are the articular cartilage and the acetabular labrum. When these structures wear out we use the term degenerative tearing. Over time, degeneration of the cartilage and labrum within acetabulum will lead to hip arthritis. There is no role for arthroscopy in the treatment of hip arthritis – those patients likely need a hip replacement. In general, arthroscopy in the presence of arthritis is sometimes considered, especially for younger patients if the x-rays do not show the joint to be too badly worn. The arthritis may continue to deteriorate in the future, eventually requiring a total hip replacement, but it is preferable to preserve the natural joint as long as possible. While an artificial hip is superior to a painful, worn out joint, it is not a normal hip and carries with it numerous concerns. These concerns include the seriousness of the procedure, life-long precautions that are necessary with an artificial joint, and the possibility of the artificial joint becoming painful and requiring revision. As is often the case for new technology and evolving treatments, it has been difficult to get insurance to pay for hip arthroscopy. Insurance companies do not necessarily take the steps to keep up with the advancements being made. Many published scientific studies prove the clinical importance of this procedure, but that does not guarantee the insurance companies recognize the medical necessity of them. These publications have guided treatment recommendations and must be followed to get insurance approval for the procedure. These are broad guidelines and there are minor differences with each insurance company. Our staff works diligently to keep up with the changing guidelines of the insurance companies and do everything we can to get them to cover these procedures. Failure to response to all conservative treatment options including activity modification, PT and medications.